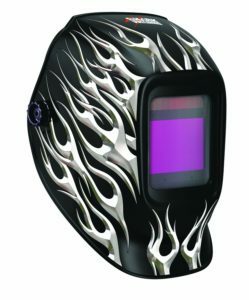 The shark auto darkening Expert Pro black flame theme helmet is painted (instead of a decal) to offer you the best quality image possible. It comes with Shark’s top-of-the-line auto-darkening Expert Pro 820S lenses which is 95 by 85 mm. The variable shade lens goes from shade 6-9/9-13. All adjustments on the helmet are internal and it has 4 sensors. The on/off is automatic and it has a solar cell power with a replaceable battery. The switching time is 1/25,000 with a low/high by an infinitely adjustable dial control. The lens also has a grind mode with a delay time of 0.1-1.s by dial control knob. The Low TIG Amps rating is >2 amps/DC; >2 amps/AC. Applications for the lens are Stick welding (DC and AC); TIG (DC, DC Pulse); TIG AC(Pulse) MIG/MAG; MIG/MAG Pulse, and Plasma. Excellent low amperage TIG response. Not for Laser Welding. Adjustable headgear gives you a comfortable wearing helmet.